The rich, spicy and refreshing flavours of pho make it the gateway dish for Vietnamese cuisine, but don't let it stop there. 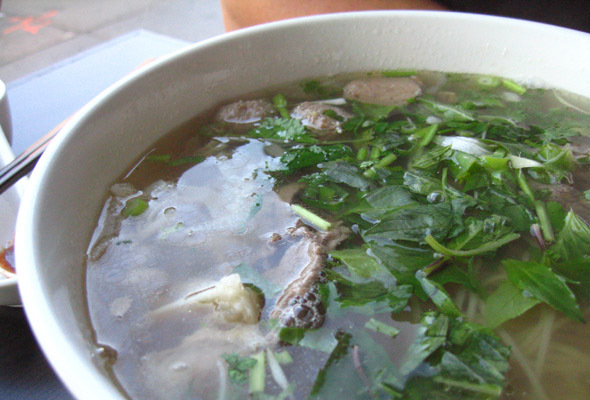 Many of the Vietnamese restaurants scattered throughout the city focus on the well-loved broth but few dare to venture beyond the typical like Pho Phuong. After selecting the table of our choice in the slick renovated room, we scan the menu and pick a few favourites. Tucked into the appetizer section are some fantastic breakfast items and an elusive duck noodle soup can be found further in. Once we mark down our order, we're in for a short wait with utensils and bowls of sauces arriving in the meantime. Expertly wrapped fresh rolls filled with jicama, dried shrimp, egg, herbs, and the usual crunchy vegetables are the first items to reach our table. The balance of rich, salty, sweet and herbaceous is a delicious start to the meal. An accompanying hoisin-based dipping sauce tends to mask the various flavours and we almost prefer it without any adornment. The server makes space for an enormous plate that holds the House Broken Rice. 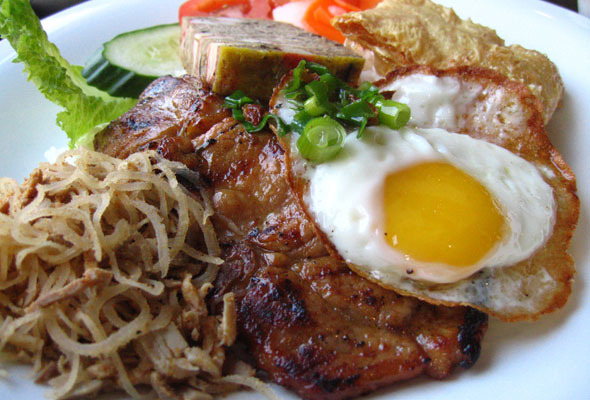 Fanned out over a pile of soft rice is a juicy pork chop, shredded pork, crab omelet, crispy shrimp tofu packet, pickled cabbage and carrots, and perfectly fried sunny side up egg. Bursting the supple yolk and pouring all the sweet and spicy sauce overtop offers a dish full of richness and tang. The crab omelet is more like a silky pork meatloaf studded with fake crab and vermicelli encased in a thin egg exterior. The crispy shrimp tofu packet is a perfect play in texture contrast. Even though I might consider pho ubiquitous, we've ordered an extra large House Pho for its comforting qualities. A basin of spicy and rich broth drowns the rare beef and it arrives cooked. At least there is ample protein available and the tendon is tender. This soup is easily my favourite as it seems watered down at many other downtown restaurants. Our last dish arrives as we're nearly full but the crispy pancake is always worth the wait. A crisp shell of coconut milk and mung bean grips several perfectly cooked shrimps and pieces of pork with fresh bean sprouts spilling out from the fold. Tearing away some pancake, rolling it into a piece of lettuce, tucking in a few herb leaves, and dipping it into some sauce exemplifies the Vietnamese masterfulness in handling a multitude of flavours. 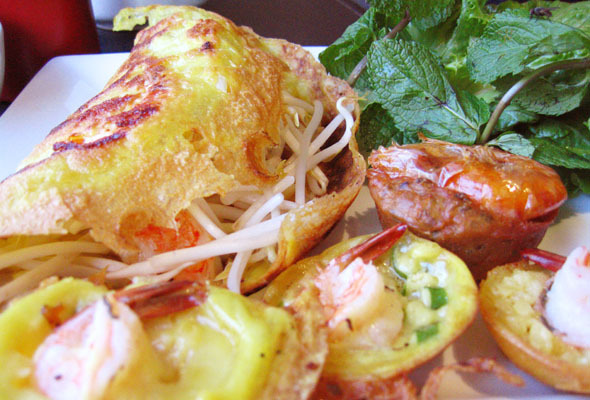 The shrimp "tarts" are nearly replicas of the pancake in a more tender form and are full of coconut and mung bean flavour. A darker "muffin" style shrimp cake is milder and uses red beans to a drier effect. 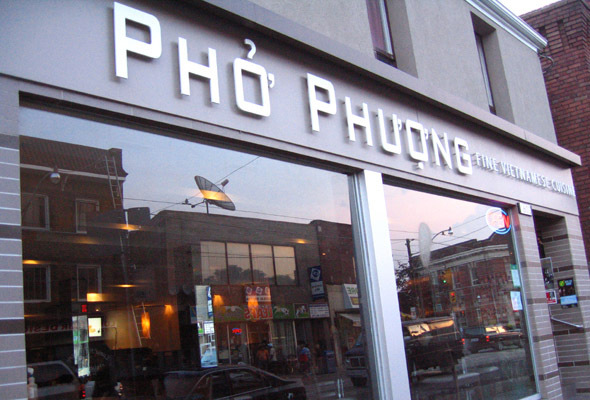 Praise may be overflowing when it comes to Pho Phuong, but it is all deserved. Although a little stale bread may sometimes arrive with a dish, more than likely nearly a whole star fruit will appear in the steak salad, the Thai curry will have never been infused with as much lemongrass, and Vietnamese food in all other restaurants will pale in comparison.